I love so many different ESSIE colors and this color, muchi, muchi, is the most adorable one I have seen! I just painted my nails and toes with this color, and I’m so obsessed. This delicate and girly color will compliment so many outfits, and perfect for spring! Physician’s Formula mascara and extensions performs miracles. Seriously, not kidding. I have seen so many serums or fiber lash extensions that seem just too expensive to invest in. This duo not only really actually works, but is super affordable. Brush on the mascara, then brush the fiber extensions over your lashes. Apply mascara again to lock in the fibers, and repeat for as much volume and length as desired. Schwarzkopf’s Stylist Ultime Biotin+ Volume & Texture Magic Volume Powder is another miracle product! I saw Carli Bybel use this product in one of her hair tutorials and had to try. Shake a little powder on your roots and rub in. Instant volume in seconds! Benefit’s High Beam has been out for a while and I finally bought it while splurging in Sephora the other day. It’s perfect for a radiant and dewy complexion. I dab a little on my cheekbones and nose for a shimmering and highlighted look. Lumene Vitamin C cream is my new favorite daily moisturizer. I bought the day cream from CVS, and there is a another one for night. I use this every day and after washing my face with hot and cold water. I have definitely noticed the vitamin C helps my skin appear brighter and smoother. Recommend trying if you’re looking for something new! Lastly, Smashbox’s O-Plump lip gloss is another that has been for veryyyy long and that I finally added to my lip gloss collection. This lip plumper and gloss is my favorite one that I have ever used. This gloss glides on clear and then turns just the right shade of pink for your lips, while instantly plumping. 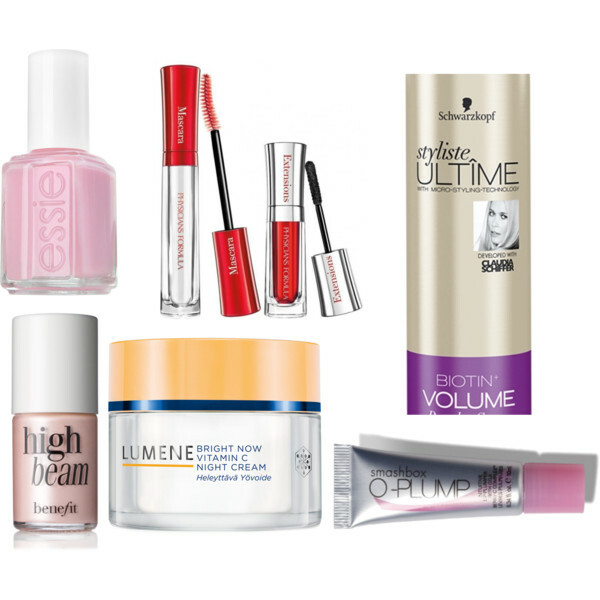 Shop all the products below and comment with some of your favorite recent beauty buys!